Below is a simple example of a mathematical model of inductor-connected wire-in-pipe technology provided by IntelliServ, a JV between Slumberger and NOV. The model describes the behavior of the communication platform in transmitting signals from the Bottom Hole Assembly (BHA) to the top-side computers. Below is a simple example of a mathematical model of inductor-connected wire-in-pipe technology provided by IntelliServ, a joint venture between Slumberger and NOV. The model describes the behavior of the communication platform in transmitting signals from the Bottom Hole Assembly (BHA) to the top-side computers. Measurement technology is advancing in the oil and gas industry. Innovations such as wireless transmitters, reduced cost of measurement technology, and increased regulations that require active monitoring have the effect of increasing the number of available measurements. 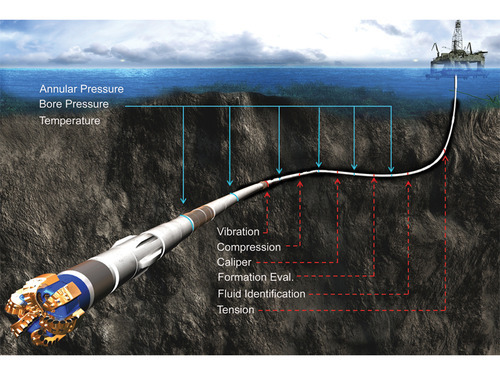 Measurement technology is advancing in the oil and gas industry. 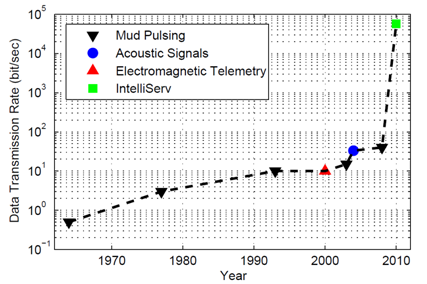 Innovations such as wireless transmitters, reduced cost of measurement technology, and increased regulations that require active monitoring have the effect of increasing the number of available measurements. Increased bandwidth does not necessarily lead to improved operations. Some describe this as Drowning in Data, Starving for Information. Below is a simple example of a mathematical model of inductor-connected wire-in-pipe technology provided by Intelliserv, a JV between Slumberger and NOV. Contact support@apmonitor.com to learn more about Advanced Process Monitoring for upstream drilling and production systems. This flood of information can be distilled into relevant and actionable information with Advanced Process Monitoring. The purpose of APM is to validate measurements and align imperfect mathematical models to the actual process. The objective of this approach is to determine a best estimate of the current state of the process and any potential disturbances. The opportunity is in earlier detection of disturbances, process equipment faults, and improved state estimates for optimization and control. The principal input to the model is the voltage to the motor.